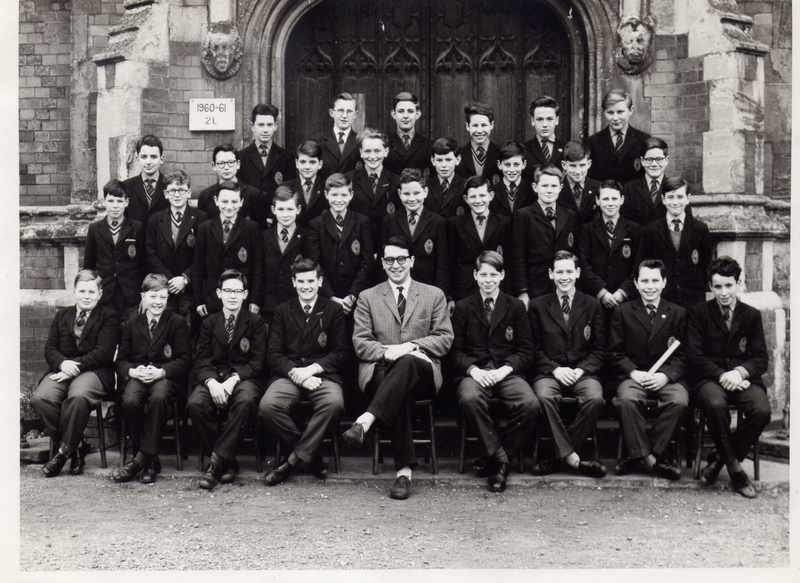 At the age of 12, though, my shyness hadn't improved any, with the result that Form Master Mr 'Taffy' Marshall wrote on my Autumn report: "Works most conscientiously at all times, though still not active enough in lessons. He must try and overcome this timidity". I think he must've said the same thing at a parents' evening or something, because my mother gave me a really hard time over it, shut away my collection of Famous Five books, and told me to make more of an effort to mix in instead of keeping my head stuck in a book all the time! It was about this time, I think, that the school got its own swimming pool. My parents had chipped in a quid or two to the Parents' Association appeal fund that helped raise the money to build it. Before that, we'd all had to go traipsing down in a crocodile to the town baths at the Pump Rooms (where the public library now is). 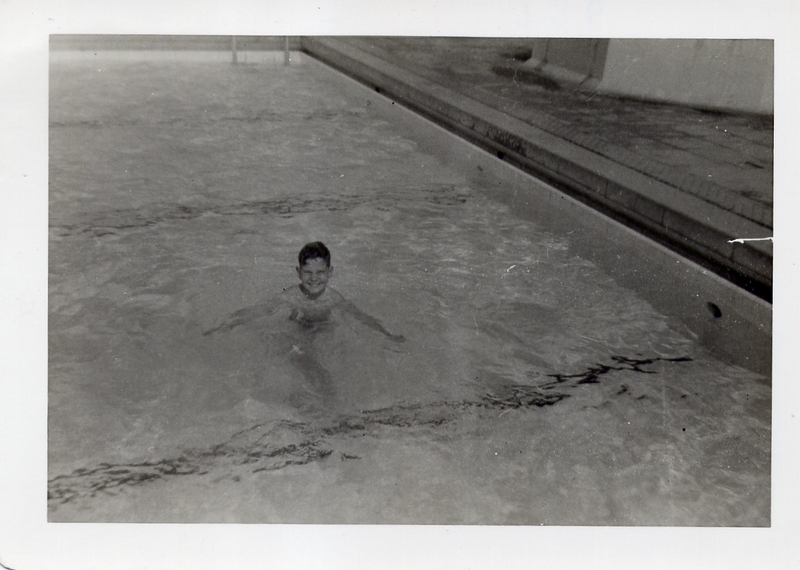 I'd learned to swim out in Hong Kong and had become quite proficient if not exactly fast, but against the attraction of an outdoor pool in a tropical climate, the indoor one at Leamington paled more than somewhat and I didn't enjoy it much. As an aside, when years later as part of my job I went to a meeting at Leamington Library, and passed the stack in the basement which is where the deep end of the pool had been, I half-expected to see an "xxxx was here" written on the wall by one of my former classmates! This is me in the pool at the USRC out in Hong Kong. 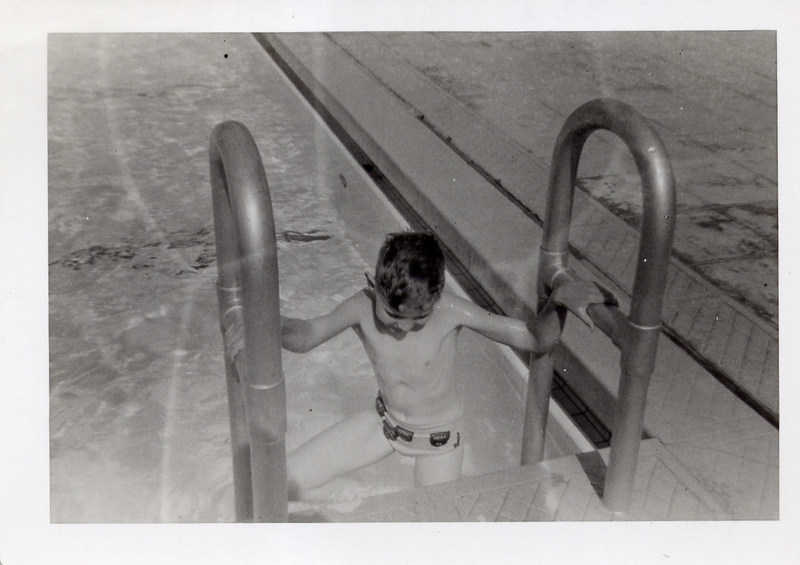 The little badges on my swimming trunks denoted how many lengths of the pool I could swim, the top one being 50.